Deonte Bellinger engaged in digital learning at Carpe Diem, a charter school in Ohio. Photo provided by Carpe Diem. A new way of teaching and learning is making its way into some public schools that, if it gains enough traction, could turn the traditional education system on its head. "Blended learning" is not about credits or grades; it's about mastery through personalized learning. Students typically have no preset grade level. Nor are there predetermined course completion dates. Blended learning combines face-to-face and digital lessons in an adult-supervised environment. The way it's done varies from school to school, but a common denominator is that the location, tools and pace of instruction are carved out for each student's learning needs. "They get through at a pace based on their individual goals -- not because they are in seventh grade. And they don't accept a 'C' or 'D' because it is passing. They stay with [the class] until they master it. Conversely, if [advanced students] finish in nine weeks rather than 15, they move on to the next course," said Bob Sommers, CEO of Carpe Diem Learning Systems, describing that Ohio-based company's blended curricula, which is similar to other programs. Ninth-grader David Unthank had a whole curricula tailored for him, at least with his chosen elective in interior design, which he plans to study in college. "It's a software program where you design 3D room models. You can drag and drop furniture from an aerial view," said David. He also uses tools enabling him to research average income and what a day would be like as an interior designer. And he can check out college programs online. 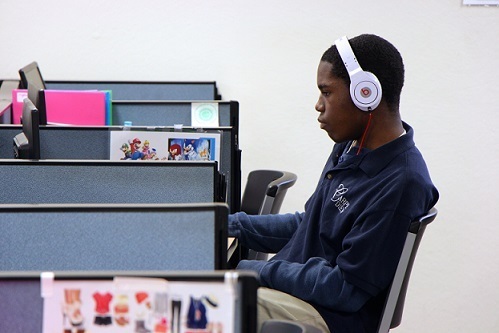 David usually starts his day in the learning center at his charter school, which is part of Cincinnati Public Schools. He logs on to his computer, and up comes a blue screen with color-coded charts, telling him the percentage of each course he has completed. Throughout the day, the chart turns from red to blue to green, depending on whether he is on track, falling behind or ahead. "It's intimidating if you get behind, but you can always get help," he said. Students shoot a virtual ticket to the instructor, roaming the room with his electronic notepad, who walks them through their challenge. "When I am ahead, I am free to go to other classes. I don't end up bored, working on what I can already do," said David. While the student next to him studies Biology, David listens to a "virtual teacher" elaborate on the Civil War PowerPoint presentation that fills his screen. Later he regroups with a few peers who heard the same presentation, and they sink into an in-depth conversation about what it will mean for freed slaves to enlist in the Union Army. Schools around the nation are reporting improved performance outcomes -especially in low-income districts where kids have struggled, such as two California schools. The top score on that state's academic performance index (API) is 1,000; 800 is the target score. Two years after implementing blended learning, a Los Angeles school got a 991 on the API and, shortly after, a neighboring school's score jumped to 978. A US Department of Education meta-analysis found that students in fully online courses outperformed those in "live" classes. And blended learning students outperformed those in fully online courses. Riverside School District in California offers blended learning in kindergarten through 12th grade. Requested test scores were not disclosed to Huffington Post. But Rick Miller, the superintendent of schools who brought the model to Riverside, shared anecdotal testimony. "Students are increasingly better learners and more inquisitive," he said, recalling what happened after each child received a device with Internet access. "We got a bill from the phone company with roaming charges. These kids were off on vacation, still working on their Algebra. We hear from parents they're in the car on the way to Grandma's doing their assignments. They are reading chapters two or three times when they may not have read them through once in a text book," said Miller. He believes the motivation is driven by two factors: students' ability to immediately access information and their attraction to technology. Miller is bringing blended learning to Santa Ana Public Schools, the sixth largest school district in California. The project is a work in progress as he addresses issues like limited bandwidth, and obtaining a computer for each student. "We should have a bandwidth of 2 gigabytes by the end of this year. In another year we should be at 5 gigabytes, which is when everyone can get on line. "And today, I have 30,000 devices and 60,000 students. So we are half way there." Blended learning demands a radical change in teachers' roles. "Teachers are transitioning to facilitators who must use multiple resources [such as computer programs tracking student's progress]. They have to decipher from a lot of data that shows how students are doing. "And they must be able to adjust their [lesson] plans, based on that information to reinforce concepts," said Kelli Campbell, senior vice president at Discovery Education. Discovery develops digital curricula that schools around the world use to supplement live classroom work. The organization also sends coaches into classrooms to teach faculty an entirely new way of doing their jobs. Their "Flipped Classroom" model exemplifies some new demands on teachers. Lessons that are traditionally done in class become homework. And what is traditionally homework is done in class. "Students may listen to a recorded lecture at home. Then come to school and engage in interactive lessons based on concepts they gleaned from the lecture," said Campbell. "The teacher may have to adjust instruction based on what needs to be revisited, and be prepared to give feedback immediately." Often, parents can log into a secure portal to track their children's progress and attendance. David's mother, Kim Unthank, likes this -- and she likes that she can talk face to face with her son's teachers and the school board. She home schooled her son for years. "In time, I felt he had surpassed me academically and that I wasn't challenging him enough. But I didn't want to send him to a traditional public school. He would have been in three classes of 30 kids each; I didn't want to throw him in that huge mix. "I feel like he's in better hands education wise. But I can still be involved." Currently, there are more than 7 million online learners in kindergarten through 12th grade, according to Michael Horn, co-founder of Clayton Christensen Institute, a nonprofit engaged in education policy conversations. As the trend continues, he said, "I think we will see more innovation in mainstream public schools. But we are in early stages of making change." Read "Blended Learning (Part 2): Policy Issues and Best Practices"